The 2 Tone, a Cultured Hooligan exclusive. 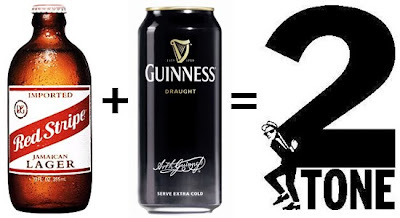 This is a quick and easy drink recipe that I created* when I had Guinness and Red Stripe in the fridge. Based on the classic Black and Tan. 1. Grab the pint glass and hold it at about a 45 degree angle. 2. Pour the Red Stripe along the side of the glass about half way up. 3. Put the pint glass on the table, grab the spoon and hold it with back of the spoon facing up over the opening of the glass. Makes it easier if you have a black and tan spoon, but not necessary. 4. Slowly pour the Guinness over the spoon. Do it slowly and you'll see the Guinnes laying on top of the Red Stripe. 5. Let the Guinness settle, drink up, and enjoy. 6. When done repeat steps 1-5 with the remaining beer. *No, I'm not so delusional that I think I was the first to come up with this. As I was doing this a quick Google search came up with the name Black and Red, but the 2 Tone is such a better name.